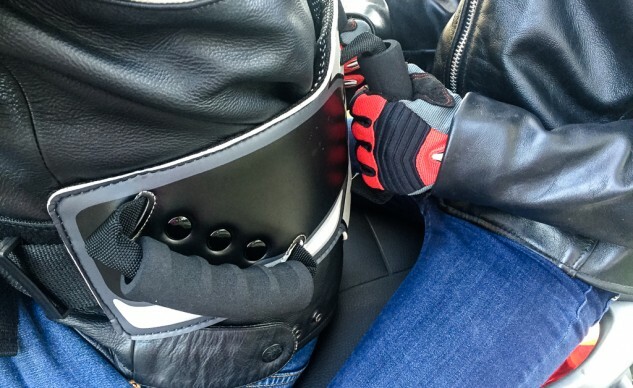 In my article, Evans Off Camber – Precious Cargo: Riding With Kids, I had photos my daughter using a Children’s Riding Belt which actually straps her to my body. While I still think that it’s a good idea for longer rides where her attention could wander or she could fall asleep (I’ve seen it happen with other peoples’ kids), I’ve been looking for something more convenient for running errands or school drop offs. So, I contacted the folks at Left Coast Mobility Systems about getting a Grip-n-Ride to test. In a matter of days, I had not one but two Grip-n-Rides in my possession. The first is a standard $89 Grip-n-Ride. The second, a limited edition Street Art Collection Grip-n-Ride, priced at $169. 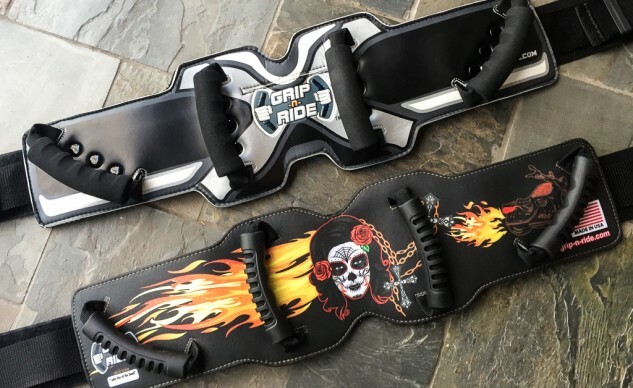 The standard Grip-n-Ride (top) and the Street Art Collection Grip-n-Ride. 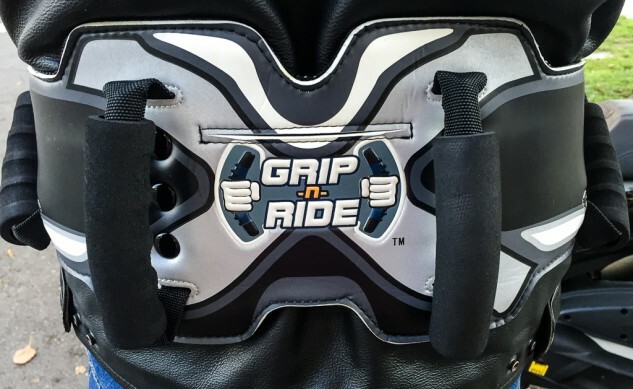 The Grip-n-Ride is similar in design to a kidney belt or lower back support belt. The standard belt is constructed of a soft, padded plastic outer layer backed with a nylon mesh for cooling airflow with an open cell foam layer in the middle. The Street Art Collection differs in the slightly stiffer outer texture of the belt on which the design is printed, but the interior is the same. The standard belt also has a small pocket. Two pairs of handles are mounted on the belt: one vertical about six inches apart in the center of the belt, the other pair is located on the sides and are at an angle for an easy grip. The grips themselves have foam padding – complete with finger notches – over a solid core. One end of the belt is a three inch wide nylon strap backed with the loop portion of Velcro. The other end is a similar width elastic band with the hook fastener. Because of the length of the nylon strap, the entire belt is adjustable in size from 28–54 in. which should fit most people. A second nylon belt is secured via a sturdy plastic clip, giving additional security to the belt. 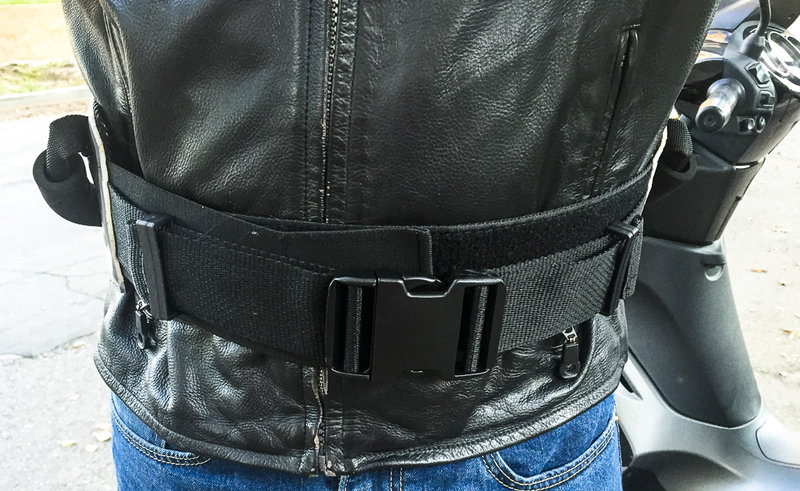 The dual belts give maximum adjustability and two levels of security. To don the belt, you simply center the grips on your back and wrap the long strap across your stomach. The elastic strap is pulled across the first strap, making a snug fit. Next, the secondary plastic clips are closed. Depending on the type of bike you ride, your passenger may find either the center or side grips more comfortable. For sportier riding, the manufacturer says the belt can be rotated around, placing the handles in front. While I can see how this would be good for canyon riding with an adult, my daughter’s arms are too short to comfortably reach around my torso. Note how the Grip-n-Ride has been rotated around with the center handles in the front which would give an adult passenger a sportier riding position. My daughter preferred to use the outer handles in all of the riding situations we tried. She said she felt more stable with them than the center ones. Either way, she’s now excited for me to take her to school on a bike. Before, with the harness belt attached to her body, she wouldn’t even entertain the idea of me riding her there. Not surprisingly, she felt the harness negated all of the coolness of showing up on a motorcycle. That trepidation is gone with the Grip-n-Ride. The padded handles have a solid core and finger cutouts for comfort. I need to take a moment in this product review to make an editorial statement: I’m more than a little puzzled by the website and promotional videos put together by a company that claims it “was born of the necessity to make the power-sports industry as safe as possible for passengers as well as riders” while showing riders and, more troubling, child passengers not wearing proper motorcycle gear. 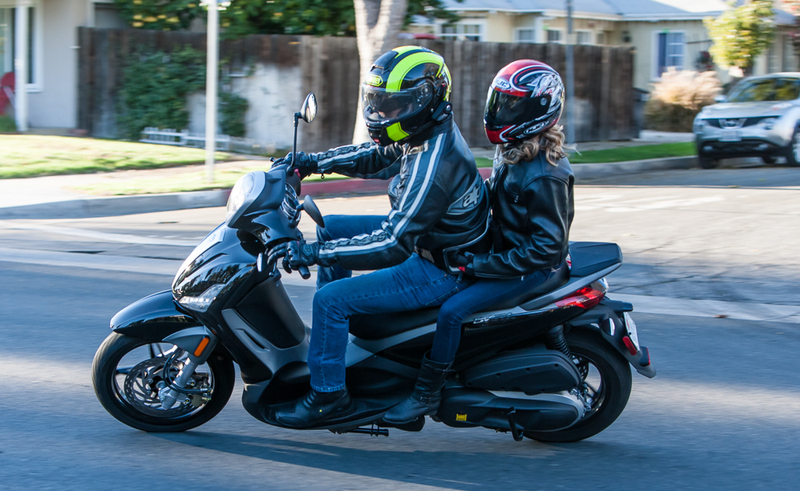 If Left Coast Mobility Systems bills itself as a manufacturer of a safety product, it needs to walk the walk about motorcycle safety. Yes, adults have earned their right to make decisions – even bad ones – but putting a child on a motorcycle in an adult-sized helmet? 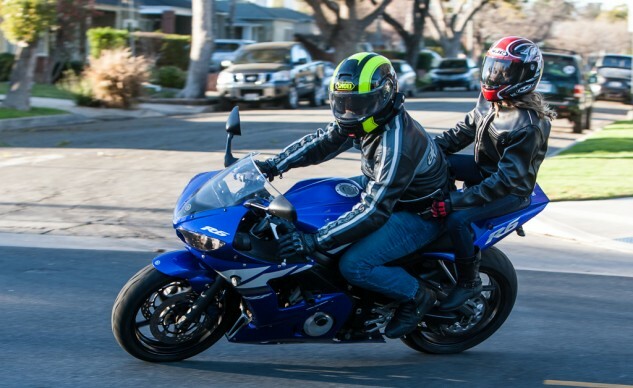 Remember, an improperly fitting helmet can cause injuries in a crash. Letting a child ride in shorts and short sleeves with no gloves? I just don’t get it. End of rant. The padded handles provide better grip than having the passenger hold on to the rider’s waist. I’m happy to have learned about the Grip-n-Ride. It is now part of our family riding gear. (Although, I will probably still use the harness on longer rides out of the city.) While some people I’ve shown the Grip-n-Ride felt that the $89 price was a bit high, I think the quality of the construction will make it last quite a while, and by the time my second daughter is old enough to ride without the assistance of the handles, I will have gotten more than $89 of use out of it. Also, it’s hard to put a price on knowing that my daughter feels more comfortable on the bike – which will translate into more father-daughter rides. The additional cost of the Street Art Collection is a matter of personal preference. If you like the designs, you’ll be more likely to want to pay the additional $80. However, Left Coast Mobility Systems also offers the service of producing a Grip-n-Ride with your own custom design. If this appeals to your, check out their website: grip-n-ride.com.